What's a Typical Paid Holiday Schedule in the U.S.? Paid holidays are not required in the United States by any government regulations. This is because the Fair Labor Standards Act (FLSA) does not require an employer to pay employees for time that they do not work, such as for vacations or holidays. Employees in the US receive an average of 7.6 paid holidays, according to The Bureau of Labor Statistics in the category "all full-time employees." Professional and technical employees average 8.5 paid holidays. Clerical and sales employees average 7.7 paid holidays. Blue collar and service employees have, on average, 7.0 paid holidays. A 2016 study of paid time off by the WorldatWork Association found that nine paid holidays was the norm in the United States. Private Sector Paid Holiday Schedule in the U.S. These are the most common paid holidays in a private sector organization's paid holiday schedule. They will vary by the company based on the needs of the employees and the needs of the business. For example, even companies that offer these paid holidays may have jobs that must work on the holidays. This is a necessity, or in some cases, a choice for profitability, in industries that serve customers 24 hours a day, 7 days a week, and 365 days a year. These jobs include manufacturing when capacity and customer demand requires more hours; direct patient healthcare services including nursing, emergency room services, hospital food services, custodial services, and more; open retail establishments; restaurants; gas stations; drug stores; convenience stores; some technical and customer support positions; and grocery stores. Other services require employees on-call such as physician's offices, telephone services, electricity providing utilities, snow removal workers, and so forth. These people may have to depend on a fair on-call schedule to get to plan celebrations on otherwise paid holidays. The majority of employees who work jobs that must be staffed on holidays are hourly paid positions. As a reward for working the holiday (and to make employees feel better about working on it), these employees often receive additional compensation in the form of time and a half or double time pay. Additionally, some organizations add several of these days to their paid holiday schedule. This depends on regional differences and the input of employee feedback over time. Christmas Eve, and/or New Year's Eve. Another commonly paid holiday option is a floating holiday or two in which the employee determines the day to take off as part of his or her paid holiday schedule. These are offered so that, for example, employees with various religious and cultural celebrations and memorials and employees who wish to extend paid holiday weekends, have more options. Other organizations offer paid holidays for the employee's birthday, and/or for election day. Knowing what your employees want is the key to a successful paid holiday schedule. 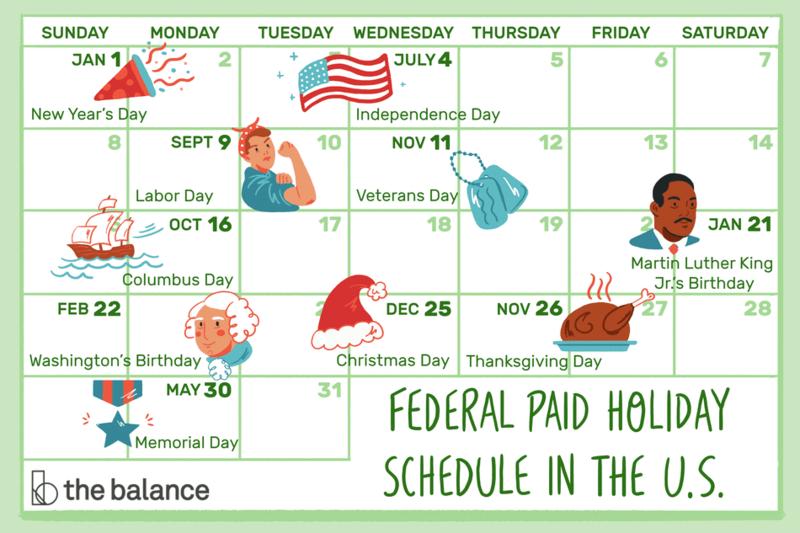 Federal Paid Holiday Schedule in the U.S.
Federal law (5 U.S.C. 6103) establishes the following holiday schedule for Federal employees. According to the U.S. Office of Personnel Management, "most Federal employees work on a Monday through Friday schedule. For these employees, when a holiday falls on a non-workday—Saturday or Sunday—the holiday is usually observed on Monday (if the holiday falls on Sunday) or Friday (if the holiday falls on Saturday). This law also designates the names of the paid holidays such as Washington's Birthday. Many public sector organizations, local and state governments, and so forth, base their holiday schedule on the Federal holiday schedule. In the U.S., this is the Federal paid holiday schedule. Now that you know the typical paid holiday schedules in the U.S., how does yours compare or how is your outlook affected by knowing what other employers offer? To attract and retain superior employees, you need to stay close to or slightly above the norm to meet employee expectations for paid holiday time off.